We've loved living here, and it's been such a tough decision to move. Now our work commitments have increased our commute is nearly an hour and a half each way, so we're just looking for something closer. We'll really miss it! Set in the heart of the popular village of Jacksdale, this imposing family home is well situated for access to local amenities including shops, medical facilities, schools and countryside walks. 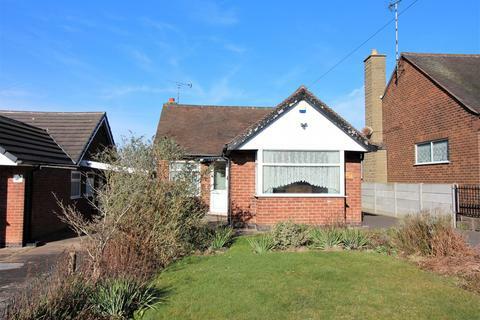 It is also within easy reach of several popular commuter routes including the M1 Junction 27, A610 and A38 for larger townships and cities such as Nottingham, Derby, Mansfield and Alfreton. Maintaining the Edwardian charm of the property with beautifully rendered glass leadwork, an oak-coloured uPVC double glazed front door with side panel opens into the entrance hall. Finished with a classic ‘Minton’ tiled floor, high wooden skirting and faux-oak panelling, the hallway provides access to all ground floor rooms including the formal dining room, breakfast kitchen, family lounge and under stairs store through (potentially) original wooden doors. There is also a radiator, selection of power points and ceiling spotlights. At the of the hall are the stairs to the first floor. Recently renovated, the breakfast kitchen is lit by an oak-style uPVC bay window with Edwardian inspired glass leadwork to the front, with complimenting window to the side elevation and door to the rear garden. Bright and spacious, the kitchen includes a range of high-gloss cream wall and base units with wooden-style work surfaces and a complimenting island-come-breakfast area, a stainless-steel sink unit, integral dishwasher, four ring electric hob and eye-level electric oven and grill. Decorated in fresh shades of pastel green with complimentary grey tiled floor. There are also two radiators, a selection of power points, and ceiling spotlights. The formal dining room is a great space for entertaining, able to comfortably fit most dining suites and accompanying furniture. Lit by an oak-style uPVC bay window with Edwardian inspired glass leadwork to the front, there is also a radiator, selection of power points and ceiling spotlights. Decorated in contemporary shades of white with feature zoological paper and high skirting board. A stunning inglenook-style aperture surrounding the chimney breast – ideally situated for a feature stove or open fire with appropriate works – is flanked by oak-style uPVC double glazed windows. Complimenting windows and patio doors lead out to the rear garden. Decorated in contemporary shades of white with high skirting boards, there are also a selection of power points, radiators and ceiling spotlights. This excellent storage space still sports a cold shelf and is lit by an obscure glazed window to the side of the property. An oak-style uPVC door from the rear garden opens into the utility, providing plumbing for an automatic washing machine and space for another appliance such as a tumble dryer. There is also a wall-mounted combi boiler. An oak-style uPVC door from the rear garden opens to the outdoor WC. A set of carpeted stairs, with central landing, lead to the first-floor landing. Lit by an oak-style uPVC double glazed window, the landing provides access to all bedrooms, the family bathroom and storage cupboard through (potentially) original doors. Decorated in fresh shades of cream with high skirting and faux-oak panelling, finished with a radiator, power points, radiator and wooden balustrade. The first of three large bedrooms is lit by an oak-style uPVC double glazed bay window with Edwardian inspired glass leadwork. There is a radiator, selection of power points and ceiling spotlights. Overlooking the rear garden through an oak-style uPVC double glazed window, the second bedroom is currently used for guests, and includes a radiator, selection of power points and radiator. Lit by an oak-style uPVC double glazed window with Edwardian inspired glass leadwork, the third bedroom is decorated in contemporary shades of white with high skirting and cream carpet. There is a radiator, selection of power points and ceiling spotlights. This handy storage area is lit by an oak-style uPVC double glazed window with Edwardian inspired glass leadwork. Decorated in cream with ceiling spotlights. A stunning and well-equipped family bathroom lit by two oak-style uPVC double glazed obscure windows to the side of the property. Including a white low flush WC, complimenting hand wash basin and panel bath plus a feature walk-in shower recess with waterfall shower head fed from the combi. Finished in white tiles, with contemporary décor, towel radiator and ceiling spotlights. A driveway provides parking for up to two cars with access to the rear of the property through a high timber gate. To the front, a stone wall and wrought iron gate border the traditional lawn with mature shrubs and a bisecting pathway to the front porch, finished in black and white tiles. Enclosed by a mixture of block, timber and hedge boundaries, the rear garden is an excellent space for entraining. Including a large decked area with scope to add an outdoor chiminea and a raised lawn area. There is also an outside tap and lights. Property reference 16698. The information displayed about this property comprises a property advertisement. OnTheMarket.com makes no warranty as to the accuracy or completeness of the advertisement or any linked or associated information, and OnTheMarket.com has no control over the content. This property advertisement does not constitute property particulars. The information is provided and maintained by MCM Estates & Lettings - Jacksdale. Please contact the selling agent directly to obtain any information which may be available under the terms of The Energy Performance of Buildings (Certificates and Inspections) (England and Wales) Regulations 2007 or the Home Report if in relation to a residential property in Scotland. With a bold contemporary finish, this three-bedroom family home includes driveway parking, landscaped rear garden, spacious lounge, modern dining kitchen and more. Close to local amenities and countryside walks. EPC rating D.